This is an interesting book in that it is not about dealing with the dead in terms of care (hospice, funerals, etc.) 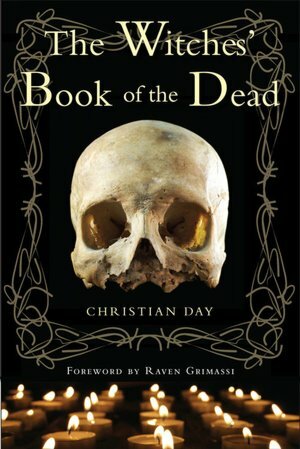 But actually working with the dead: necromancy, mediumship, It is written in a straightforward style that is informative and interesting. The book opens with a bit of history and back story about Witches and their role in the practice of talking to the dead. Day asserts that witches of old often worked with the dead, and this practice has fallen out of favor in modern times. The next section goes into the basics: tools, connecting with the spirit world, and what Day calls "The Death Current", or the state of being connected with the flow of energy of the dead. Day also goes into having an altar to the dead and the importance of the skull to a Witch. With that we get what we really want to know: how to work with the dead, protect yourself if needed, and how to communicate with the dead. Each of these sections are covered step by step, making it easy for both the novice and the expert to commune with those passed over. Day does not skimp on the warnings: these rituals are serious business and all dealings with the dead is extremely serious. He is not a 'nice' author and is very clear about his viewpoints. For example, he is completely dismissive of and form of witchcraft that can comfortably brush elbows with other religions, and takes a pretty simplistic and dismissive view of them. Also, while I agree with him that witches should pay attention to their dead, I found his attitude of 'call on the dead any time' rude. (I think the dead should be invited, not coerced, and only in dire cases). He speaks of non-Witches dismissively as “the mundane”, which smacks of elitism. While I’m familiar with attempts to cast Jesus as a Witch, dragging the Buddha into that conversation stuck me as odd. Finally, I think its weird that you can work entirely outside of Christian cosmology and theology and yet use the saints and the archangel Michael as tools. Necromancy has gotten a very bad rap: it’s association with evil-doers and Satanism has discouraged many people. Even Day advises caution when summoning spirits because negative forces can come through as well, but at the same time argues that there is nothing inherently sinister about death magic. Not for beginners, and not for everyone.